This Highlands NC home for sale located at 2020 Upper Divide oozes curb appeal. The 4 bedroom, 4.5 bath home sits on a lot that is 1.4 acres in size and is in the Highlands Falls Country Club. Great views of Whiteside Mountain and dazzling landscaping are but a few highlights of this fabulous home for sale. Club membership is available but entirely optional. This lovely Highlands NC property has been well maintained and features many upgrades. Inside the home the living room boasts a wood ceiling accented by beautiful beams. Here you will also find gleaming hardwood floors and a floor to ceiling stacked stone fireplace. The oversized deck offers space for entertaining or simply relaxing. There is a screened porch complete with a stone, gas fireplace. The floor plan flows nicely with the living room transitioning to the dining room with a custom wet bar complete with ice maker and wine cooler. The remodeled kitchen has beautiful cabinetry, slate countertops, and stainless steel appliances, including a built-in Miele Coffee System. 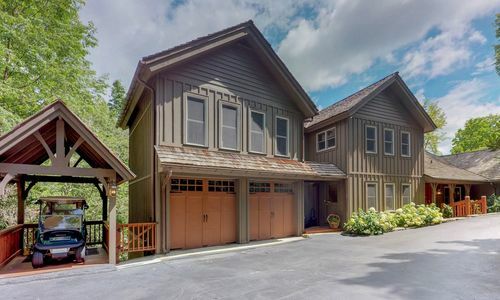 The bedrooms in this Highlands NC home for sale offer plenty of peace. The master suite is offset for privacy and features a stone fireplace and beautiful mountain views. Here you will find his and her closets, a dressing table space and an upgraded bath with soapstone countertops. Bunk beds are located in the upstairs alcove. Here you will also find two large guest rooms with ensuite remodeled baths featuring granite counters. There is also a spacious guest house with a living room complete with fireplace and wet bar and another ensuite bedroom. This exquisite Highlands NC home is offered fully furnished and ready to move in. The price also includes the golf cart! This Highlands Falls Country Club home for sale is a must-see! Contact our team at Berkshire Hathaway HomeServices Meadows Mountain Realty today to schedule a private showing of 2020 Upper Divide. We welcome the opportunity to update you on current market conditions while helping you with your Highlands NC property search. Let our knowledge and experience serve as your guide to locating the ideal Highlands NC home for sale for you and your family.